I wrote about Prashant Pandey’s Shelf Life II and Sarnath Banerjee’s Barwa Khiladi – a gallery of underachievers in this week’s The Mag. At first glance, there doesn’t seem to be any connection between Prashant Pandey’s new exhibition, titled Shelf Life II, at Gallery Maskara and Sarnath Banerjee’s Barwa Khiladi — a gallery of underachievers at Project 88. Banerjee’s prints tell endearing stories about mediocre athletes. Pandey is a sculptor who works with found objects and there’s rarely anything humourous in his work. If you consider the moods of the two shows, they’re completely opposite. Barwa Khiladi is sometimes hilarious and constantly amusing. The sculptures inShelf Life II, on the other hand, are shadowed with melancholia. Here’s what the two do have in common: the starting point for both artists’ work is rubbish. In Pandey’s case, this is literally the case. His last show had works using sweat, blood and even urine (his own). This time, the materials are less personal, but no less rejected. Pandey has used objects like chunks of road tar and dried sweet lime pulp to create his sculptures. You might recognise that “Black Moon” is made up of bits of a road — particularly if your commute forces you to travel on roads that look about as fragmented as Pandey’s sculpture — but if you can figure out the original materials of “Yellow” and “As I Cut Them”, you deserve a prize. An installation view of Shelf Life II. From left to right: Black Moon, Yellow, Missed and Woven Mirror. “Yellow” is an off-white cube, which looks unremarkable until you realise Pandey sculpted it out of sweet lime bagasse (the dry, pulpy residue that’s left behind after the fruit has been juiced). The circular fruit has died and been reborn as a white cube. “As I Cut Them” looks like it belongs in a hair salon because it seems to be made up of swatches of hair that look shiny and soft, like ponytails from a shampoo advertisement. They’re actually bunches of sharp, spiky copper wire. “Love”, a massive heart-shaped sculpture that hovers in mid-air, is made of marble blast stones that give the work an almost balloon-like quality even though marble is anything but light and airy. While Pandey’s use of the mediocre and rejected is poetic, Banerjee opts for a more humourous take on immortalising those whom we’d relegate to the trashcans of history. Banerjee was commissioned to create a public art series for the Olympics in London this year. Considering the reputation Bengalis have for being disinclined towards athleticism, Banerjee and the Olympics seemed like a curious combination. However, Banerjee chose to create a series about underachievers and proved that the Bengali dedication for slacking off physical activity could hold its own even when faced with the Olympics. Curated by the Frieze Foundation, Banerjee’s drawings of Olympics non-medallists were seen as billboards and posters all over London and now they’re enjoying pride of place in Mumbai. As usual, Banerjee’s work is great fun and its strength lies more on Banerjee’s storytelling skills than his drawing prowess. Take for example, the ping pong player who at a crucial moment is distracted from the game because he can’t remember the correct spelling of eerie. Banerjee tells you about a high jumper whose commitment to keeping himself primed for a sport at which he’s not particularly good means he spends his days contemplating gravity and surrounding himself with all things light: “Light food, light music, light reading”. 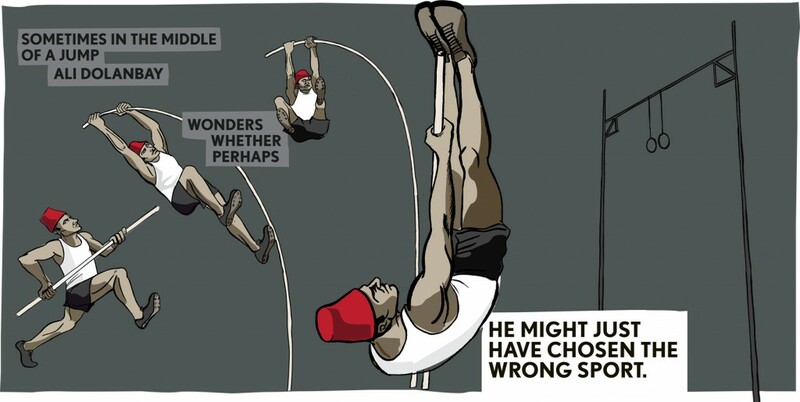 The only thing that grounds the high jumper is his lone medal, which is bronze. For all the humour in Banerjee’s work, what makes his work charming is that there’s no finger-pointing at failure. On the contrary, he’s full of sympathy for these rejects who persevere despite being losers, because they show true dedication. Anyone can stick to doing something they’re good at, but if you continue with something despite failing, that’s love. In Banerjee’s show, it’s the fact that they’re rubbish at what they do that makes them heroes who are worth immortalising as art. The ancients from all over the world had been convinced that an object known as the philosopher’s stone, which could turn base metal into gold, existed. Christians and Muslim alchemists of yore believed God was supposed to have given it to Adam. In Buddhism and Hinduism, it was known as chintamani and appears in many legends. Philosophically speaking, the idea behind the stone is simple optimism — the stone makes it possible to create something precious and refined out of the ordinary. No one’s found the philosopher’s stone so far (except Harry Potter), but Pandey and Banerjee have come close enough. Generally, when you walk into a gallery, you expect two things: light and silence. Enter Gallery Maskara and you’re plunged into a darkness that is made all the more eerie by the whirring noise of projectors playing Belgian artist Ruben Bellinkx’s 16mm films on loop. “The Trophy” presents a set of videos that Bellinkx has made over the past five years, beautifully displayed in the cavernous gallery. All except one use animals (predictably, animal rights activists aren’t enamored by the artist’s work but Bellinkx took great pains to ensure the animals were much happier and settled than the videos they starred in). The first work that greets the viewer shows a dog and a chair. Further inside is a table whose legs are on the backs of four turtles. In the depth of the gallery is the work after which the show has been named — featuring a reindeer and a wall. Ensconced in a niche above the door is one work that may initially seem out of place because it lacks the leit motif of animals. 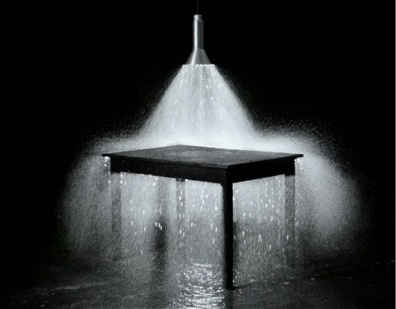 The black and white video shows water streaming, seemingly out of a lamp, and bathing a table with light and water. It’s a hypnotic video, made all the more dramatic by the fact that it’s tucked deep in an unapproachable, dark corner. You can’t go up close. You can just maintain your distance and stare at its continuous loop as you try to work out its meaning. Actually, the connection between all the works in “The Trophy” isn’t the presence of animals but rather the fragility of what we know as human civilization– the human effort to dominate the uncontrollable aspects of nature and create an orderly pattern. Civilization is supposed to be proof that we’ve left the bestial side of ourselves behind. “The Trophy” isn’t entirely convinced. Through his videos, Bellinkx wonders whether the orderliness that we value as a sign of evolution isn’t an illusion. Every video in “The Trophy” shows a symbol of human civilization – a table, a wall, a chair – but they are each redefined by natural elements. The most violent work in the exhibition is the set of three videos showing the chair. In the first, one dog is seen with the chair. It wags its tail, sniffs around, and watches the immobile and unresponsive object. In the second videos, two dogs join the first one and the pack attacks the chair. The last video shows the three dogs panting but at rest, with the chair reduced to splinters all around them. Given that the chair is a well-established symbol of authority and power, the central theme of this work is quite obviously an attack upon civilization. There are also disturbing ideas of the destructive quality of a crowd mentality and the terrible effects of miscommunication. After all, the solitary dog was quite friendly. It’s when the dog received no response for its friendly gestures that the pack entered the scene. But does the dog know that a chair doesn’t have the equivalent of a tail wag? Is the pack being manipulated by someone (like an all-knowing artist, for instance) to destroy the chair? In “The Table Turning”, a table moves slowly on the backs of turtles instead of being rooted to a spot. At first, the image is simply cruel. It looks like an attempt to domesticate the animals but when you consider how the table is rendered useless by the turtles, the power balance shifts in favour of nature. Yes, they carry it on their backs but they’re not immobile and crouching inside their shell. They move, and with a certain degree of coordination, to render the table dysfunctional. Manipulation is one of the major themes of the show. In the video showing the table under a shower of water, it looks like the water (a natural element) is falling out of the lamp (a man-made element). Look closer and you realize that this is an illusion. The lamp simply appears to release water. In actuality, it has no control over how much water washes over the table. The illusion is most powerful in “The Trophy,” which is as clever in execution as display. Two screens are arranged so that you can’t see them simultaneously. One shows a reindeer mounted upon a wall. Within seconds of standing before it, you realize the animal is alive. You can hear the breath, see the flare of the nostrils on occasion. Perhaps the most unsettling aspect of seeing this half of “The Trophy” is the complexity of the power dynamic that Bellinkx sets up between the viewer and the work. To be mounted while alive should be a painful experience, almost akin to a crucifixion. But the reindeer’s face shows no expression. It looks down regally and impassively, as though it is lording over the scene. The second scene shows the other side, literally. The reindeer’s body, neck down, stands steady and still on the other side of the wall. There’s an occasional tail twitch. Bellinkx has placed the animal between the death pose of the mounted trophy and the vitality of a reindeer standing on its own four legs. It’s a strange, disconcerting and yet fascinating limbo, much like the entire exhibition. This review first appeared on ArtSlant. Max Streicher makes sculptures using spinnaker, a lightweight nylon with a tensile quality that is dull white in colour. He stitches it into forms that are then filled with air to create inflatable sculptures. Particularly in his larger works, there’s a monumental quality thanks to the size as well as the marble-like texture that spinnaker acquires once it catches the light. 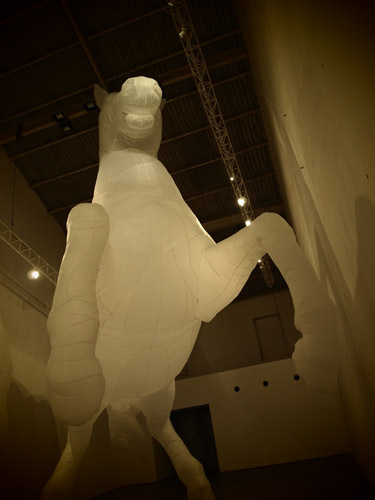 This illusion of solid immensity is completely at odds with the fact that the sculpture is largely made of air and can be deflated and folded up to fit in a little suitcase, which is probably how the two massive horses in Gallery Maskara came to India. Ashwamedh is Streicher’s second show in Mumbai’s Gallery Maskara. At 30 feet by 30 feet, the two horses in the exhibition make fantastic use of the gallery’s soaring ceiling (it used to be a warehouse). Their translucent spinnaker bodies soften the lights shining on them so that they look like glowing, mythical creatures. As with much of Streicher’s work, there’s a charming balance of technical sophistication and accessibility in the two prancing horses. Regardless of age and background, all visitors are likely to be filled with wide-eyed awe at the sight of the enormous sculptures. Because Streicher doesn’t fill the spinnaker sculptures tightly with air, they’re just slightly slack, which gives the forms a few natural creases and wrinkles. It also makes the horses bob gently, as though they may move out of their mid-prance pose at any moment. They’re accessible and yet imposing because these aren’t simple blow-up dolls. They harness in their forms the mythologies and legacies of classical sculpture, in which horses have played an important role as symbols of virility, strength and victory. Ashwamedh is a fascinating example of how context and location can transform art. Streicher has shown horses before in North America and Europe. The ones in Gallery Maskara at the moment are indeed among the four that Streicher suspended from the ceiling of Toronto’s Union Station in 2007. What’s fascinating about the exhibition in Gallery Maskara is how the context adds to a work. As in the Western mythology evoked in Streicher’s equine displays, horses symbolise strength and virility in India. However, there is a central difference. In Europe and America, the rider-less horses are reminiscent of the majesty of the wild. They symbolise freedom and the possibility of magic (remember unicorns? ), which is always shown as a power that lies beyond the scope of the average human mind. This is the festering darkness that Streicher’s luminous horses couldn’t invoke when they were shown in Toronto or Germany but could when they come to India as Ashwamedh. History and ritual add layers to these beautiful works, highlighting the tenuous balance between fragility and strength that marks Streicher’s work. Look up at the neatly-stitched parts, and they give a sense of equine musculature. The subtle movements of the hoof and the way the horses seem to rear up towards the light imbues the sculptures with a special dynamism. Ashwamedh is a beautiful meditation on power and the poetry of form. The fact that Streicher’s spinnaker can stretch itself to take on various cultural interpretations makes it that much more powerful.